← Who is Yeah Samaké, and what does he want? This book is not about Bamako, my current home, although some of the field research for it was conducted here. Nor is it a book about Brazzaville, Congo, although most of the field research for it was conducted there. In fact it’s not really about anyplace, strictly speaking, and that’s just the point. As an anthropologist, I study people, and there’s only so much you can learn about people by studying places. I didn’t always appreciate this fact. When I began the fieldwork that led to Migrants and Strangers in an African City a decade ago, my approach was centered on a specific, geographically situated community 160 km north of Bamako. I call this community “Togotala” in the book, using a pseudonym. A decade ago, I tended to think of human communities in terms of points on a map. It was the time I spent in Togotala and with Togotalan people elsewhere (in Bamako, in New York, and later in Brazzaville) that helped me realize just how misleading the place-bound concept of community can be. Maybe that’s all family really is — a group of people that miss the same imaginary place. There’s absolutely nothing empirical about home, belonging or identity; all require acts of imagination. Something I struggled with while writing Migrants and Strangers, and with which I struggle in my current research in Bamako, is the problem of defining who is “in” and who is “out” of the study. In Brazzaville, my target population was people who came from elsewhere, specifically West Africans (and, more often than not, Malians); the book examines how they identify with distant homelands while living and working in places like Congo. This time around, to learn about marriage practices in Bamako, I’m trying to target people for whom Bamako is home, in a city where most people identify at least to a degree with someplace else. A man can live most of his life in Bamako, but if he remains active in the politics of his native village, regularly sends money to relatives there, marries within his village community, and sends his children to grow up there, can we really consider him Bamakois? Do his marriage practices reveal anything about marriage in Bamako? Since the question of where someone belongs is inherently subjective, my interviews here begin with a subjective question: “Do you consider Bamako your home?” Even answering “no” to this question, however, doesn’t automatically disqualify someone from participation in my research. Any single criterion for inclusion — say, a minimum number of months or years spent in the city — is arbitrary. I’m still trying to define who should be in and who shouldn’t, but for the time being I’ve decided to cast a wide net. A Malian family in Brazzaville, 2005. In 2008 the elderly parents “retired” to Bamako, though they’re originally from the Sikasso region. Very few of the migrants I knew in Brazzaville were from Bamako, and these had only formed a mutual aid/self-help association in 2004 — something their peers from rural Mali had done decades earlier. Yet Bamako figures prominently in the lives of Malians abroad. Even those who don’t come from the capital city often return to settle there at the end their migration careers. Many of the biggest homes in this town were and are funded with migrant remittances. 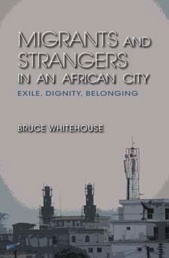 One final note about Migrants and Strangers in an African Society: for years, I had been using the working title “Exile Knows no Dignity,” which is a Bamanan proverb referring both to the humiliations migrants endure and to the place-bound nature of identity formation in contemporary African societies. I was attached to this title because it encapsulates so much of what the book is about. My editor at Indiana University Press prevailed on me to change it, however, arguing that the proverb was too cryptic to make a good book title. In the age of online search engines, the argument went, a title should clearly convey the subject matter within the first 42 characters. So we took my working subtitle — “Migrants and Strangers in an African City” — and made it the new title, while the old working title was distilled into the new subtitle. Not so poetic, but it gets the job done. Glad you got plugged in ‘Time’. Hightly thought-provoking blog. Particularly valuable at the current time.